Happy lunar new year to everyone. I hope the year of the snake will bring good health and wealth. During my recent hiatius from my blog I have traveled to some very interesting places in Vietnam. One of these places is the Ca Mau Province. 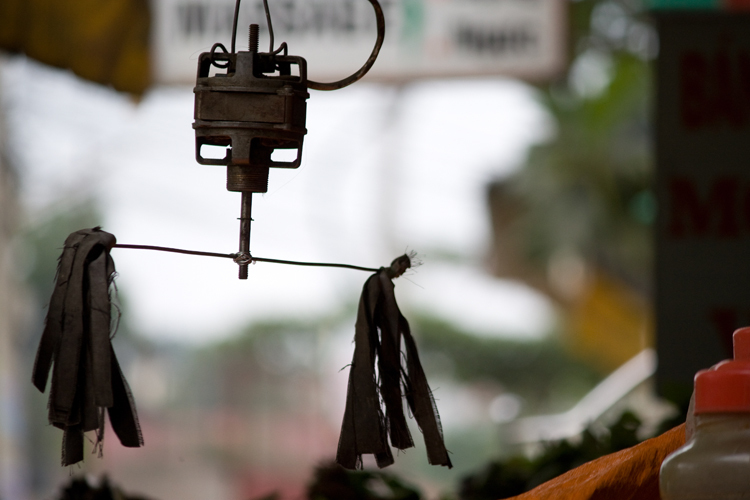 Ca Mau Province is the southern most province of Vietnam and is home to major fishing and agricultural industry. By far the fastest way to get to Ca Mau from Ho Chi Minh City is by air. 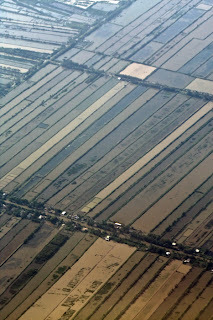 Below is a picture from the airplane of some of the many marine farms in Ca Mau Province. I should note that the picture does not do justice to the beauty of the geometry of the farms nor does it capture the vastness of the farming industry. When we got to Ca Mau city (the capital of the province) I was greeted with the colorful buildings and many rivers of Ca Mau. 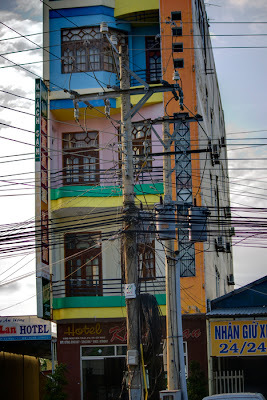 Below is one very colorful hotel I saw near the city center and is representative of many of the color schemes in the area. The rivers in Ca Mau are extensive. When traveling around the province you will encounter many rivers and canals. A typical river and the houses on the waterfront is seen below. 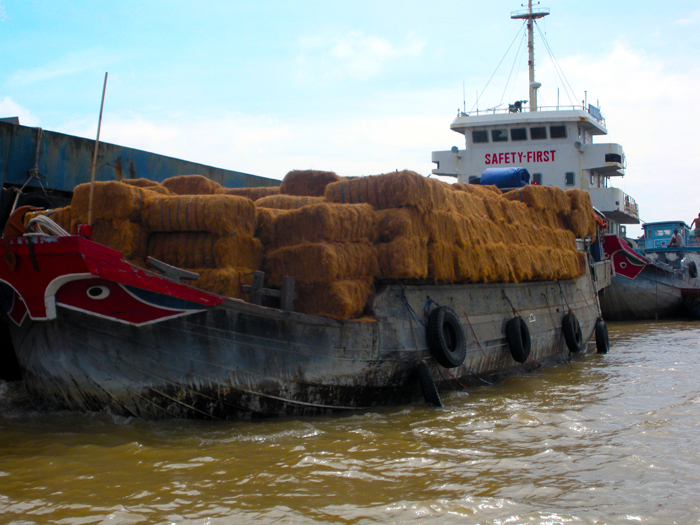 These rivers and canals are often used for transportation, not only of goods but of people; when we traveled to the southernmost point of Vietnam (Mui Ca Mau) we went by boat from Ca Mau city (nearly 75 km). At Mui Ca Mau we encountered many strange and unique animals. We saw many different kinds of birds, bright neon blue crabs which were no bigger than a centimeter, and even a strange fish like creature that used its fins to walk along the mud (unfortunately the pictures did not come out too well). 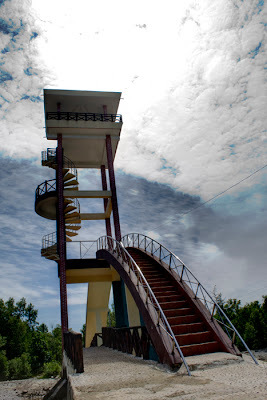 Below is a picture of the observation deck at the southernmost point of Vietnam. The flora in Ca Mau is impressive. Everything is wild and natural and the colors of the fruits and flowers are striking. 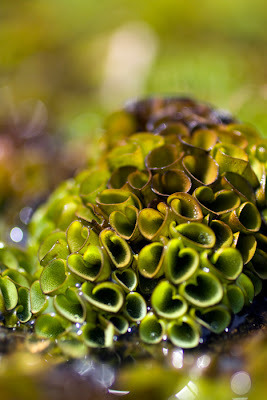 I decided to play with my macro lens and took some closeups of a couple of the plants I thought had interesting texture. After sightseeing we went for karaoke at a venue that had live musicians for private rooms and was owned by one of the most famous traditional folk singers in Vietnam. The name of the place escapes me now but when I return to Ca Mau I will definitely find it again. 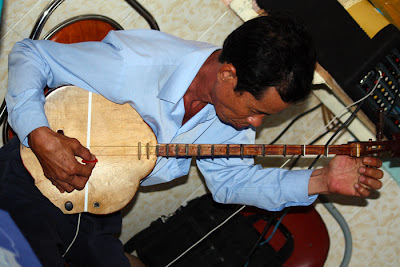 Our musician is seen below playing a traditional Vietnamese instrument. It had only two strings and significantly less frets than the western guitar but the guitarist seemed to be unaffected by its (by western standards) limitations and was able to skillfully evoke feelings of a older and simpler life. Ca Mau was a great trip and I was glad to go to a place that is off the radar of most tourist destinations. The food is fresh and delicious, the people are friendly, and the province is raw and unadulterated. I am looking forward to my next visit. 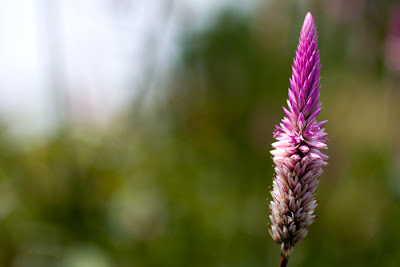 I have taken a leave of absence from the blog for a while because of lack of time. I have been busy with lots of things here like work, travel and even a (small) motorbike accident. I will have pictures and posts covering my time from the highlands to the beaches, the north to the south of Vietnam, and from the large cities to the small ones that are not in any guidebooks. I have had some issues with my laptop again and as I am working on correcting those I will also try to clean up some pictures so I can get them posted here quickly. Thanks for your patience. See you soon. 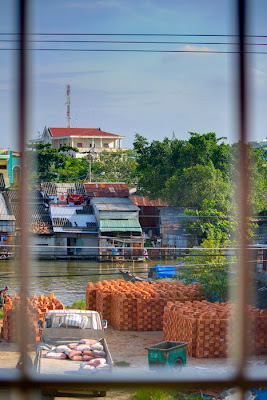 A month ago I took a trip to the coconut capital of Vietnam: Ben Tre province. The name literally translates as "bamboo landing" which is fitting because of the abundant vegetation in the region. Ben Tre is an island flanked by two of the main branches of the Tien Giang river in the Mekong Delta (the Tien Giang river itself is one of the two main branches of the Mekong river). 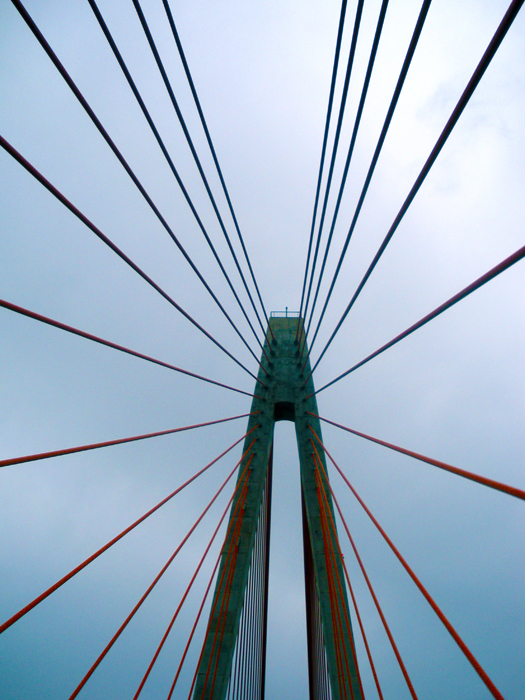 The way to access Ben Tre is by bridge. The above photo is of the Rach Mieu bridge that connects Tien Giang Province and Ben Tre Province. It is very large with the towers of the bridge reaching over 115m and enough clearance below to accommodate a 12 story building. 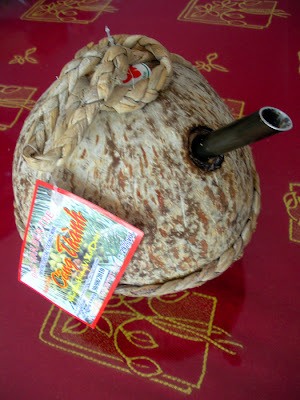 Coconuts are the most famous product of the region, and rightly so. The region produces over 300,000,000 coconuts annually! Coconuts are used in many things such as wines (above), candies, dried pulp snacks, and more than 50 local dishes. The coconut "hair" is also collected and used for floor mats (above, preparing to be loaded onto the large boat) and the leaves are collected for use in thatched roofs. The people of Ben Tre are very conscious about not letting anything go to waste. 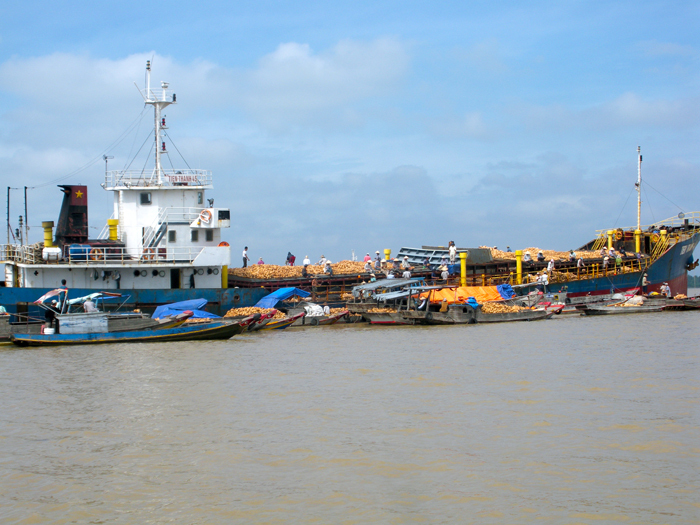 The above picture is a very typical scene in Ben Tre of several smaller boats offloading their coconut cargo onto a larger ship. As the two pictures above show, many of the coconuts (and derivative products) that are produced in the region are loaded onto very large ships for transport. Many of these ships find their destination in other countries around the world. Ben Tre is a nice place to spend a weekend if you are in the south of Vietnam. It is less than 3 hours by car from Ho Chi Minh City and is quiet and clean. Boats can be hired there easily; you can spend the day cruising the river and enjoying a quiet afternoon in a relaxing environment. After living somewhere for an extended period of time you begin to take many things for granted that would be out of the ordinary to the traveler. I have tried to bring a few images together to give a feel for the types of things one typically sees around Vietnam. Below is a homemade fan that I found at a fish shop. It was made to keep the flies away from the fish at the shop. How effective it was is debatable. 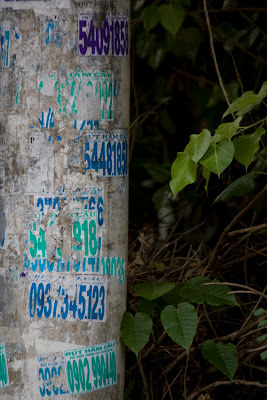 Phone numbers appearing of all types of surfaces are ubiquitous in Vietnam. They are glued (as seen below), painted, or hung on almost everything and advertise for all sorts of things. 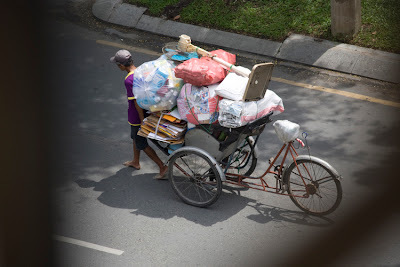 Another thing that one often sees in Vietnam is people with deftly packed vehicles. An example is the man below who was making very efficient use of space on his cyclo (Vietnamese bicycle pedicab). I am an American living in Ho Chi Minh City who is enjoying exploring the wonders of Vietnam and neighboring countries. Copyright 2010. All rights reserved. Theme images by Alitangi. Powered by Blogger.